“Ghosts of Dragonspear Castle” was the Wizards of the Coast/Gale Force Nine “Gen Con 2013 Exclusive” release to tease the new “D&D Next” release coming out next year. To really gin up some interest WOTC/GF9 made it a “con exclusive” release only available to Gen Con 2013 attendees, pre-orders only. You could not buy it at the convention, just pick it up. I am a die hard capitalist and while I am not a huge fan of limiting sales to those that make the pilgrimage to Indy I can understand the business realities behind it. Limited editions/restricted releases make for good marketing and generate buzz. This is a common practice in the gaming industry and really did not bother me too much. Then I got to Indy and found Dragonspear Castle for sale in a booth. Ok, that was a bit tacky on the part of the publishers, but I thought they had unsold copies from the pre-order that needed to find homes. Again, I could live that as it gave Gen Con pilgrims that missed the pre-order a chance to pick up a notable new gaming product. Today, I notice that Dragonspear is available on the dndclassics.com site as a downloadable PDF. I rarely get angry about my gaming hobby because it is a hobby and just not worth the effort, but this is beyond the pale. Admittedly this is truly a petty issue by the standards of real life, but it just offends me that the publisher decides to flog a “limited” product to the general public. Either it is a convention exclusive or it is not. Money, precious Gen Con gaming budget dollars, was surely allocated for this product with the understanding you only had one shot to get this content. Had it been a standard release (as it apparently is now) then purchasing it might wait until a later date. 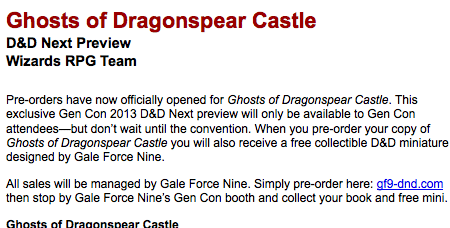 That, of course, would reduce Gen Con buzz. Wizards of the Coast or GF9 (the actual company that made this decision is unclear since they both have a hand in the product)is trying to have it both ways and that offends me. It is yet another example of the storied “Dungeons and Dragons” product line used as a blunt instrument to extract gaming dollars from a loyal fan base. I’ve been on the other side of the fence, wishing for a long time they would offer more actual content that gamers like myself, who almost never get to conventions or participate in organized events could get their hands on. I got lucky and a friend who attended GenCon got me a copy of the book, but the PDF would have been a nice alternative. Given that there’s still a perception of limited value to ebooks in the eyes of many, I can’t imagine the PDF will harm the perception of value collectors will see in the print edition; in fact I’d say the only harm at all will be in ebay sales for people looking to make a quick buck on their collectible sale. Either way…WotC does way too many exclusives in a hobby where it has many, many more fans who don’t have a way of getting those exclusives, and I appreciate that they seem to be changing their ways.